Multi Room Audio Player is a professional audio streaming software which allows you to manage multiple audio streams for playing different audio in different rooms. 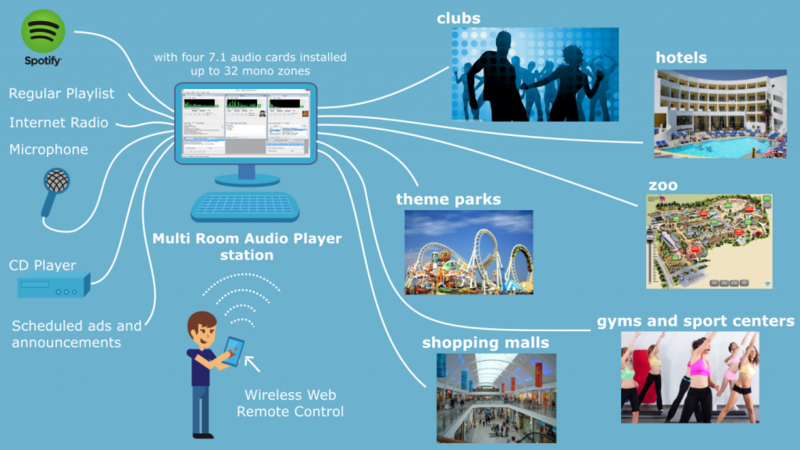 For those who need a centralized audio control center in places such as nightclub or restaurant, hotel or shop, gym, sports center, intellihouses, and even theme park or zoo or other public venues with multiple rooms, zones in which music is played, this software provides a stable and reliable solution. Using Multi Zone Audio Player, you can easily control media playback in multiple areas of a venue of any size. This is perfect for a wide variety of commercial environments. The software is designed to play multiple different audio tracks and playlists on any number of different channels on different audio cards. This is clearly far more convenient than individually managing each audio stream on a per-room basis. You can control every Multi Room Sound System zone via a browser. Please see an example sound control page. Multi Room Audio Player is specifically designed for optimizing audio playback and making as much use out of your available hardware as possible. It saves you time by providing you with a centralized media control center as well. This also makes the process more reliable. Audio tracks can be played back through each available channel of any available sound-card. For example, if the computer has one sound card which supports 5.1 (6 channels total) surround sound, you can have 6 playlists playing at once, with one for each of the channels. If you have four different audio devices in your computer, each supporting 7.1 surround sound (eight channels total), you can play 32 playlists at the same time. This means that, if you need to provide audio to a very large shopping center, nightclub or any other entertainment venue, you can easily play different playlists for every room in that venue. Multi Room Audio Player is useful for anyone who wants to play different music in multiple areas, including rooms, corridors, and hallways, in any public venue. It can save you money as well since you won’t have to hire as many people to manage each individual audio stream. In the example quoted above, you can use the software for supplying music to as many as 32 different areas of a building, yet you do not need 32 individual players running on separate computers to achieve this. Instead, it can all be handled from one convenient location with a single computer running this software. The number of rooms that the software can support is limited only by the available sound channels you have in your computer’s configuration. Even the most basic computers these days include 5.1 support, which, by itself, allows for six mom channels. Multi Room Audio Player allows you to utilize your available hardware as required, by allowing you to use one channel to play a separate audio stream. The software also supplies some useful extra features for further enhancing your results. These include an equalizer which you can use to configure the way audio sounds in each individual location. You can easily manage all of the locations using the special Zone and Player Control Center. Please see Multi Room Audio Player screenshots. In addition, many different formats (MP3, WMA, WAV, M4A, AAC) are supported, including less common ones such as OGG, FLAC and APE. Compatible with Audinate Dante and hundreds of Dante-enabled products. Multi Room Audio Player is available for commercial use. Download Multi Zone Audio Player now!